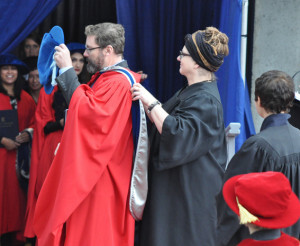 As part of the tradition of earning a PhD, Tyler Fox was “hooded” by his senior supervisor Dr. Gromala at SFU’s Fall Convocation ceremonies in October. PhDs earn the degree and additions to the graduation gear, namely, a long silken hood and a Renaissance-looking cap. Dr. Fox is now on faculty and is the Studio Director for the Interactive Media Design program at the University of Washington. Xins new paper is about how ideas of Body Image and Body Schema (BIBS) literature may enlarge general Virtual Reality (VR) research and how this motivates our design of VR for chronic pain patients. (space) The researchers focused on their new VR project designed for girls who undergo surgery for Scoliosis, and discussed how BIBS is used in this research more concrete ways. This project is lead by Dr. Diane Gromala and collaborator Dr. Gillian Lauder from BC Childrens and Womens Hospital in Vancouver, Canada. Her new work was built on former graduate student Ozgun Eyluls BIBS research. Tong plans to present this work as an oral presentation on 9 February 2015 at the SPIE conference. SPIE is an international society advancing an interdisciplinary approach to the science and application of light.